A few months ago, John D. Cook wrote about the viability of unpopular programming languages. His story starts with a comment about Perl 6, to which someone replied, “Does anyone actually use Perl 6?” (or words to that effect). What is the relationship between popularity and viability? Does a language need to be popular to be viable? As it is with art and entertainment, a long-lived cult-classic technology can be more viable than one that is popular in the moment. So this methodology should measure not how many people are using a given language, but how many are learning it. Common Lisp, Erlang, and F# are missing from PYPL, because none of them is popular enough. Perl and Haskell do appear on the index, both at <1% and sinking. However, PYPL (like TIOBE) measures popularity based on share of searches, not the volume of them. 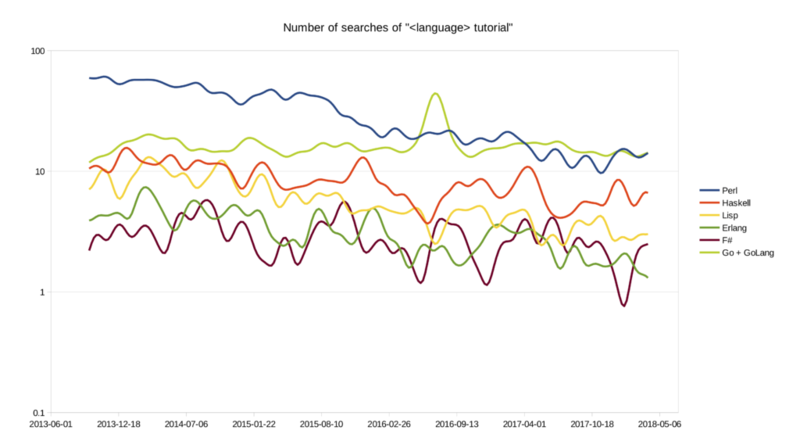 So if language A becomes bigger because more people are searching for language tutorials in general, language B’s graph line descends, even if its overall volume continues to increase. Perl is indeed more popular than Haskell, Lisp, Erlang, etc. Or at least more people are looking up Perl tutorials than tutorials on those other languages. No one seems to be searching for “Perl 6 tutorial.” Literally, zero searches recorded as far as I can determine. Google must be filtering them out somehow or lumping them together with “Perl tutorial,” even though the two searches return distinctly different results. So Google does seem to know the difference, but Google Trends is still not showing any searches for P6 tutorials, and I don’t believe that no one is searching for them. Dart is still a minor player. There are some searches for “Dart tutorial,” but there were so few that I didn’t even include it in the graph. There was a noticeable spike in searches for “Go tutorial” for about a month during July 2016. GopherCon 2016 was held July 11th through the 13th. Probably not a mere coincidence. Which of these are viable languages? I concur with John D. Cook on Haskell, Lisp, Erlang, and F#. GoLang is a viable language, being almost a decade old now, supported by Google, and increasingly used in production projects. It seems to me its growing popularity is a symptom (not a cause) of its viability. The most interesting manifestation of the popularity-viability conundrum, however, is Dart. Despite Randal Schwartz’s enthusiasm for Dart, the language is still seeking its niche. It’s been around for 7 years, but it has not yet reached the adoption chasm, much less crossed it. It may have found a “killer app” in Flutter (which is a truly cool framework for mobile apps, and Randal Schwartz’s recent lightning talk on Flutter frankly didn’t do it justice). But whether Dart will make it big is still yet to be seen. Even so, despite its lack of popularity and its newness, Dart is a viable platform for production projects. Yes, people actually do use Dart for production projects, mostly in web and mobile development. If Dart is viable, then how much more so Perl? Perl is a great language for artificial intelligence. Yeah, that makes a lot of sense. The board game Go. I know I’ve had to disambiguate GoLang and Go before myself. Perl is still popular in unix world. But there is big competitor for it (Python). I would recommend to spread it to more platform. For programming embedded Microprocessors (Atmel, Microchip …) From version 6 I was expecting that there will be possibility to compile code to exe file, so still waiting. I like that language and it help me for quick programming of data transformation or web data processing. Commercially is losing their potential from the past with new competitors. That is a pity.